3) frankly, I think this kitchen is really swell. I love all things black and white (photography, clothing, decorating). 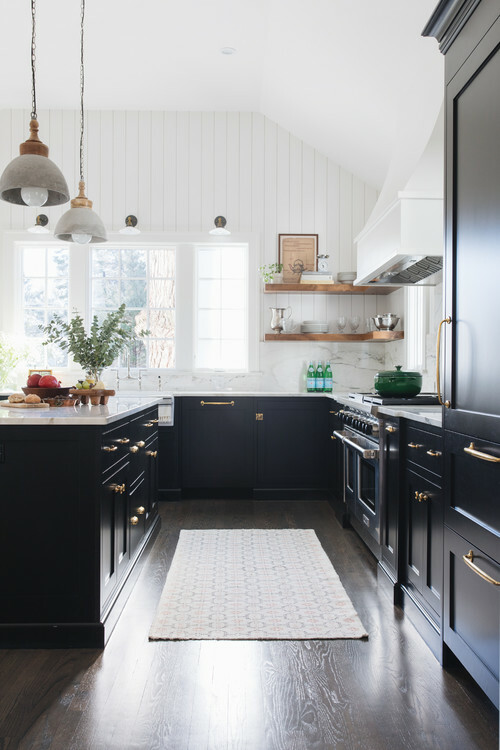 I find the dark cabinets with the white walls and white counter very striking. 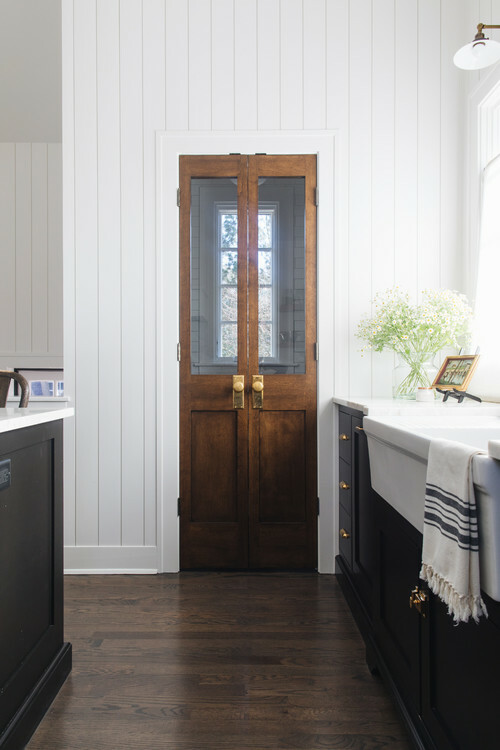 The wood floors, wood shelves and those fabulous wooden doors that lead to a small walk-in pantry bring just the right amount of warmth to the room. 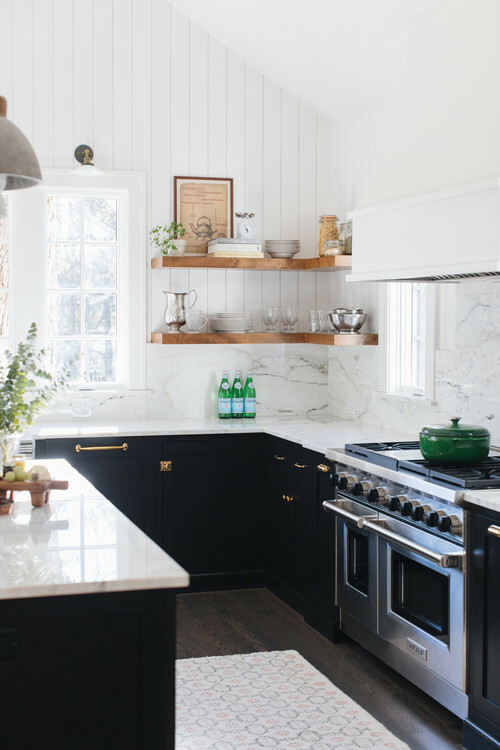 The little bronze sconces with white shades over the windows are darling (I'm not as into the clunky cement hanging pendants above the island, but I can appreciate their uniqueness). 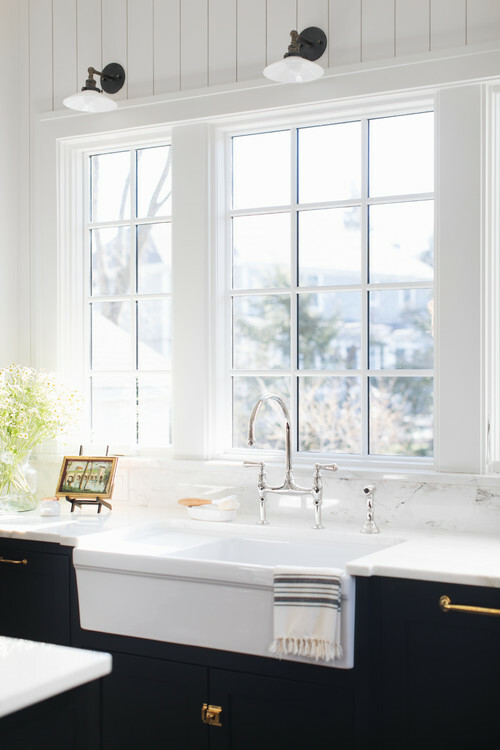 I love the white farmhouse sink and the faucet! I've pinned that faucet as one I might choose if we remodel our kitchen some day (see that Pinterest board here). I'd be very happy cooking in this room. What do you think? Is this your style? I do love it, but just don't think I would want to live with those open shelves. I much prefer cabinets - upper and lower. The rest is wonderful. Two years ago we had a contract on a house on a pretty little lake and then let it go after we got the inspection back but this is exactly what I wanted to do with the kitchen there. It had new cabinets but they were a weird orange stain so the only thing to do was paint them. Our daughter in Germany just got a new kitchen because apartments there do not come with a kitchen but just an empty room. She did mostly big drawers in the base cabinets and open shelves above and says that the drawers hold so much that she does not miss upper cabinets at all. Your comments mean so much! Thank you for visiting My Little Bungalow. My Little Bungalow is the historic home I share with my wonderful husband and our sweet dogs. Built in the early 1920's, our bungalow isn't fancy and it isn't perfect. But it's just right for us and our way of life. Join me as I share the things I enjoy: cooking and baking, antiquing and collecting, decorating, living with dogs, nature and the simple things in life. Thanks for stopping by. Questions or comments? Contact me at mylittlebungalow2 [at] gmail [dot] com. Photography is original, unless otherwise noted. If you would like to use one of my photos on your blog, please email me with your request. Thank you. All content is the property of My Little Bungalow and may not be used without permission. All photos are original, unless otherwise noted. All content is the property of My Little Bungalow and may not be used without permission. Simple theme. Powered by Blogger.